We have been providing quality eye care to our patients for over 30 years. We offer complete eye examinations using the latest optical technology found to give you the most precise and accurate prescription you have ever had. 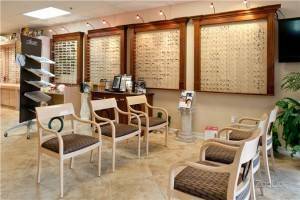 Our huge selection of eye glass frames allows you to try on many different styles. Our in office lens lab enables us to cut your glasses for you while you wait in most cases! Walk in today, and leave with your new glasses in one hour. Need sunglasses for a day at the beach or pool? We have hundreds of designer sunglasses to fit any budget. Glasses start at just $49.00 complete! Are contact lenses what you wear? We stock thousands of lenses in our office. We can mail your replacement lenses right to your door, and we fill outside prescriptions as well! We accept most vision and medical insurance plans. Don’t Wait! You deserve clear vision. Call Eye Care Plus Now 858-278-3937.